AviCenna modules include all functions required by the enterprises which are focused on patient safety and health and which render efficient and high quality service. They meet the requirements of all roles within the organization such as doctor, nurse, pharmacist and financier. They consist of the software components which include such functionality that ensures the performance of error proofing, time saving, rapid, accurate, meaningful and reliable procedures. Avicenna is our application for hospital information management system which has a modular structure and was developed taking into account the quality service, efficiency and patient security. This application ensures that the works of the available departments within the hospital are realized by being integrated to them due to its modular structure and aims to help the decision-makers at the same time. It allows fast data/information entry and saves the time of the users. It aims that the users do not make any mistakes, which is ensured through secure data saving and cross checks. Avicenna HIMS which presents the correct data in due time and thus increases the availability of the data was designed and developed with a viewpoint approaching these issues in a sensitive manner. It is still under development continuously in line with these criteria. This module has been designed for responding the questions that might be asked by the visitors, patients or patient relatives for information purpose when they arrive at hospital. The information about the room numbers, extension numbers of doctors and hospital staff, etc. can be given. It can be inquired that the patient whose name is given stays in which service, room/bed. This module can work integrated with the relevant modules. This module is the module in which the first entries and admissions of the patients who apply to the hospital are performed. Patients are directed to the polyclinics where they will get examined. This module ensures that the social security information and general identity information of the patients are recorded. AviCenna ensures that a number is given to the patient at the time of her/his first arrival at the hospital and all of the further procedures are carried out over this number. In order not to open a second file for the same patient, it is avoided to open a second patient record with the same ID number. When a second patient, whose name, surname, father’s name and mother’s name are the same, is recorded, the user is warned. The patient’s personal identity, passport (for foreigners) and contact information (home address, work address, home telephone number, office telephone number, mobile number, e-mail, website), relatives and references, family and relative relationships between the patients are recorded. The obligatory ones from the information entered with respect to the patients can be determined via the management displays. The patient information can be inquired over MERNIS system and ID numbers of the patient who do not their ID numbers can be enquired within AviCenna. The patients who apply to the hospital are given an examination appointment. The appointments may be cancelled or the date of the appointments may be changed. To call the patients to the polyclinics, the electronic patient call displays which AviCenna works integrated with can be used. The medical history forms can be identified in required details by using the advanced form identification tool of AviCenna. The medical history forms can be identified separately for each clinic, department, disease group and doctor. A hospital stay appointment can be made with the patients to stay at hospital. In this way, the current and prospective fullness status of the beds can be easily monitored from everywhere. The diagnosis and medical history of the hospitalized patient can be recorded. The request for and follow-up of the procedures required to be applied to the hospitalized patients (laboratory test, radiological examination, pathological tests, consultation, physiotherapy, nutrition, medicine, etc.) can be performed over AviCenna. The requests routinely made to the patients can be identified as template. Everything can be indicated by pressing on a single key rather than performing the same procedure every time. The patients to undergone an operation can be given an appointment by using AviCenna. 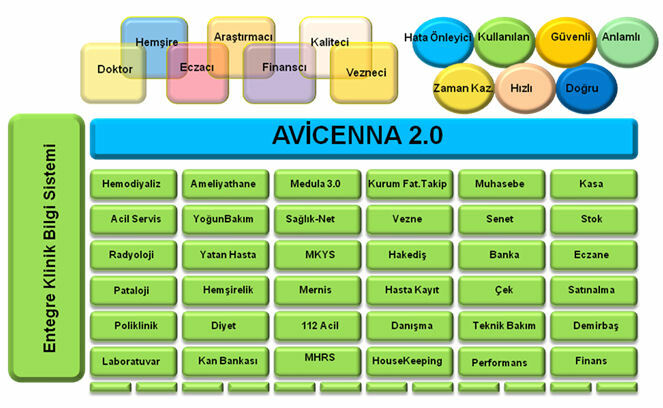 AviCenna considers all components participating into the service production and consumed as a resource. In this way, all resources (operating room, surgeons, consultant doctors, nurses, anesthetists, devices) participating into the operation service production can be given an appointment by pressing on a single key at the same time. The preoperative information about the attempt to be done (operations to be performed, anesthesia to be applied, anesthetic premedication information, team to participate) can be recorded. The patients who apply to the hospital can be given an examination appointment. The appointments may be cancelled or the date of the appointments may be changed. To call the patients to the polyclinics, the electronic patient call displays which AviCenna works integrated with can be used. The medical history forms can be identified in required details by using the advanced form identification tool of AviCenna. The medical history forms can be identified separately for each clinic, department, disease group and doctor. AviCenna records the patients who undergo a dialysis treatment for once and opens a separate session for these patients every time when they arrive. The resources can be managed regularly by entering the prospective session calendar of the patients. The information about the procedure (dialysis performed, dialyzer used, dialysate, materials consumed and additional procedures) performed performed every time when the patient arrives can be recorded. The detailed information of the patients transplanted or to be transplanted can be recorded. The reports and statistics about the dialysis sessions can be kept. AviCenna Cardiology Clinic Information System has been established for the purpose of monitoring all processes integratedly and as a whole, which have been carried out since the first applications of the cardiovascular patients to hospital. At the hospitals which render Cardiology and Cardiovascular Surgery service, it is ensured that a case record is opened based on the diagnosis at the time of first arrival of the patients and that all procedures carried out with respect to this case can be monitored integrated with each other within cause and effect relation. The stock of blood and blood products existing in the blood bank can be easily managed over AviCenna. The blood and blood products existing in stock can be reserved to the patients. The blood product outputs and returns inside and outside of the hospital can be recorded and monitored. All tests performed in the laboratory can be identified with detailed information (code, name, nominal values, phase values). Group tests (hemogram, hemostasis, glucose loading etc.) can be identified and the reference values of the tests can be varified by age, gender, device and kit used. The test requests made from other units of the department can be accepted and made ready to be loaded to the device by pressing on a single key. All examinations performed in the radiology center can be recorded with all detailed information (code, name, devices, etc.). Group examinations can be identified and it can be ensured that the examinations under the same group are displayed on the screen by pressing on a single key. The tests performed in the pathology laboratory can be identified with the detailed information such as material code, name, place where materials are purchased from, way through which materials are purchased). It can be ensured that different materials included in the same system are given different protocol numbers and monitored. 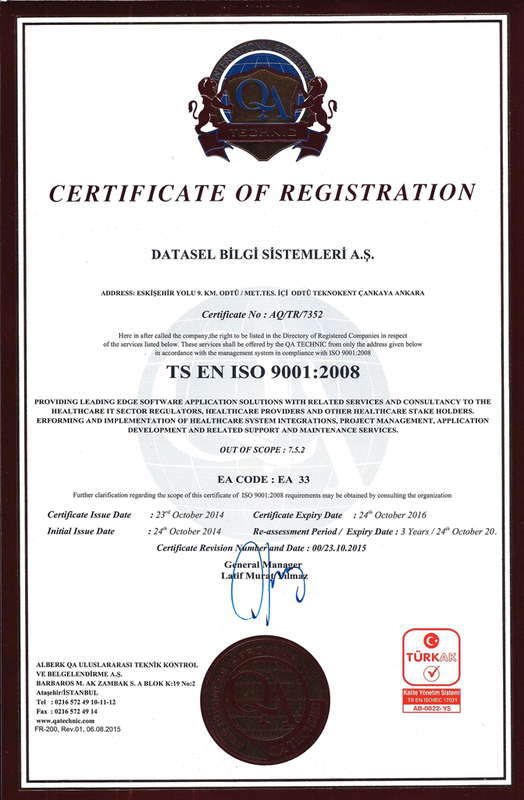 In order to accelerate the running and to mitigate the defects, barcode tag can be obtained from AviCenna and labeled on the materials. Appointment can be given and working schedule can be managed for the tests to be performed with appointment. With respect to the frozen studies, appointment can be given beforehand and appointments can be listed when necessary. The order and delivery processes which are the greatest problem in taking purchase processes of the company under control are successfully managed. Request, order, consignment note, invoice steps and the transitions between these steps are taken under control. Internal and external requests are evaluated and identified to the system as order. The whole purchase process of your hospital is monitored by working integrated with AviCenna. All inputs and outputs are taken under control by working full integrated with the finance system. In this way, the profitability rates of all sales and marketing activities can be determined. Request, order, consignment note, invoice flow and sales processes are taken under control. It is beneficial to learn the answer of the question that “what should I sell at what price?” which will increase the sale competitive power in the stock, purchase and finance management. Under the current conditions, the finance management is equivalent to the business management. The finance management has been considered in this way within Abacus and all income and outcome follow-up and management concerning your enterprise have been provided by means of this system. The finance management ensures that the information can be read from all systems necessary for human resources, payroll, sale, purchase, stock and your enterprise. It allows for all of the current financial requirements such as aging reports, projection to be easily fulfilled. Optimum inventory is the most important parameter under today’s conditions. Well knowing the suppliers and enterprises allows optimum inventory. All good or bad possibilities that may happen to your inventories in the company can be entered in the system, and thus a real cause and effect relation is analyzed. Purchase is fully integrated with the sales and demand management. In this case, all the thing that the user should do is to follow-up. Storehouses can be identified to the users identified in the system. Thus, the users cannot view the storehouses they are not authorized. Following-up and meeting of the department-based demands, and the conversion of the unmet demands into the purchase orders are carried out by the system. Full material flow is ensured by working integrated with the inventory and purchase management, and you can satisfy the needs of your enterprise in time. The demand conditions are examined in detailed. The demand conditions are parametrically determined by the system. By using AviCenna, the invoices of pay patient, SSI, BagKur, Retirement Fund, private insurances and officially transferred patients can be automatically made out. Special pricing rules can be identified to the agreements made with the institutions. In this way, it can be ensured that the patient fees are automatically calculated. The breakdown of the invoices with patient fee and the institutional invoices can be obtained separately. It can be ensured that bed and examination charges are automatically recorded. Set the estimated income and expense budgets of the enterprise, ask Abacus for their realization. Due to the Abacus integrated system management, any income or expense is automatically treated and transmitted to the budget management regardless of the mediator. Abacus Product Management will be the best assistant in the product tree creation, material inventory planning and production planning in the production enterprises. Do not you want to know the cost of each product as the raw material cost, product cost and commercial cost? The fixed assets management which works full integrated with stock, purchase and sale determines the value of the enterprise. It automatically covers all depreciation systems used. It supports all fixture transactions including fixture-based following and entering expenses one by one. This system has features providing easiness and security including advanced accounting transactions such as account locking, account completion, integration with all systems, receipt locking. The system provides you with assistance by means of its features such as receipt duplication, receipt reversion, description, modification, and foreign currency exchange, and receipt follow-up, detection of incorrect receipts, balance reports and legal books. By means of reflection templates, it is ensured that the end of period transactions are automatically taken by the system and the system facilitates the general accounting management. The following information is recorded in the system as the employee info: the employee’s employment record information, compulsory service information, information on tenure of office, contract information, severance information, information on clothing allowances, information on the relevant employee’s department, information on working times, information on exchange of offices, resignation information, information on military service, information on service score, title, position and branch of the employee, health certificate information, address information, dependent information, health certification information of dependents, education information, tally information, promotion information, rotation information, leave information, duty information, temporary duty information, course information, transfer information, assistant information, assistant thesis information, head assistant information, information on emergency contact person, penalty information, award information, sending information, list of the personnel on duty and guard arrangements, list of the personnel working in the clinics and work arrangement, information on entry of employment record scores, information on employees from outside by privatization, information on personnel subjected to law no 657, identity information, work experience information, information on trainings attended, expertise information, certificate information, information on surname change, information on correction of age, information on majority by a court decision, gender reassignment information, foreign language information, information on language exams, union information. You won’t need any more additional product for any payment transaction to be formulized for the staff or the enterprise. It has a calculation mechanism through which your information processing system can easily enter the formulas. Abacus ensures the connections with the banks, SSI and all other institutions requiring digital data transfer. The required number of wage types can be identified with payroll and the calculated wages can be put on period. This system ensures the management of the fixtures identified in the system or maintenances as an external service. Technical maintenance templates are identified. By means of these templates, the users can automatically follow-up the list of the materials required to be maintained. The users can view the reasons and results in routine maintenance and service procurement actions. AviCenna decision support system ensures that an executive can obtained all required financial and medical statistics in the form of data or graphics so as to compare them with the past periods. It is possible to obtained the data belonging to any date or a certain date range as well as viewing the current status as on-line via a single screen. The system supports the multi hospital or branch logic and can obtain the statistics of the hospital or branches one by one and can submit the centers as consolidated if required. BMJ Group is a world leader organization for providing medical information to doctors, researchers, employees working in health sector and patients. BMJ is an independent organization which has operated in medical publication for a long period of time by its history dating back 160 years ago. The information provided by BMJ is always high quality, reliable and consistent. BMJ is the world leader medical finding provider and renders clinical finding service to more than one million doctors and researchers in seven languages. 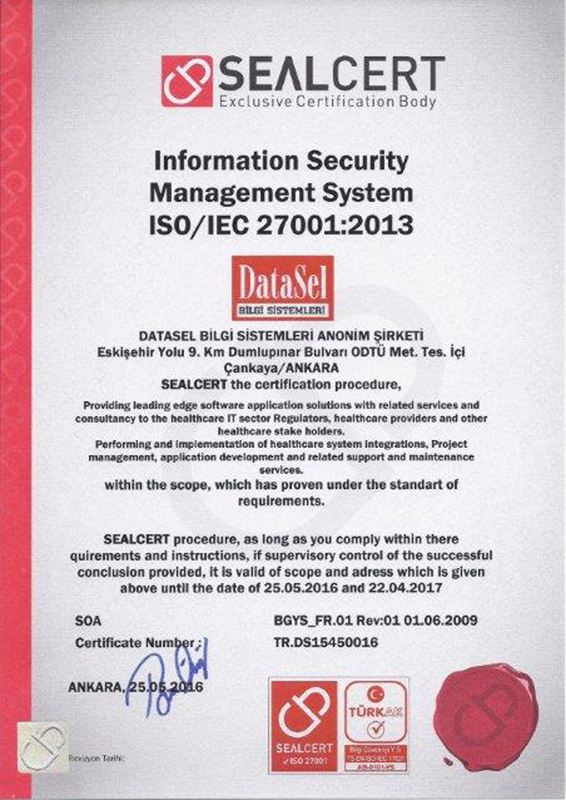 DataSel which has integrated the clinical finding database submitted by BMJ (British Medical Journal) over the Internet with a Hospital Information Management System (HBYS) for the first time in Turkey has diversified AviCenna HBYS in another field. One of the most important problems encountered in repayments of health services is the determination of whether the payments are made in accordance with the rules. The determination of which one among the millions of repayment requests is in compliance with the rules and which one is not is such a process that is not possible to be performed by man power. For this reason, it is necessary to transfer the communication between the health service providers such as hospitals, pharmacies, imaging centers and the repayment institutions into the electronic environment and to resolve the decision making process by using computer software to the possible extent. Making out the invoice including the service and materials for which provision has been obtained, controlling of these invoices by the repayment institution and rearrangement of the invoice when necessary cause staff burden on the repayment institutions and delays the payment of the service provider by extending the process. In addition to this, the most important problem is that “all items of all invoices” cannot be control one by one and this results in more payment by the repayment institutions. AviCenna e-Invoice System which has been developed in order to remove all these problems ensures that the invoice is sent principally through electronic environment. AviCenna Document Management and Archive System which has been developed independent from each platform has all functions necessary for the follow-up of the documents in the electronic environment. It is the proper solution for the Document Management and Archive of the institutions with its rich graphical management tools, flexible and powerful integration structure and high scalability. AviCenna Document Management and Archive System has been designed as having multi-layered architecture by means of J2EE technology and it works coherently with all Technologies supporting the Web Services. It is much easier to manage the processes now. AviCenna Process Management System transfers the corporate processes into the electronic environment from paper environment. The forms can be designed in the electronic environment and designing, approving, signing and transferring transactions can be followed-up in the computer environment. AviCenna Process Management System provides all sorts of means in order to manage the flows. The system matches the designed flows with the created forms and can determine that to whom the tasks will be distributed.